While his prolific mating is a clear sign of the king’s success, this unique gorilla’s extensive family tree grew out of tragic circumstances. At first, daily life for Titus was routine. He was a member of a stable group of happy individuals. The group even surprisingly allowed a young outsider to join them, which is very unusual among gorilla groups. Normally they will not tolerate outsiders. Tragedy struck when Titus’s father, “Uncle Bert,” was murdered by poachers. The young outsider, Beetsme, who had become close with Titus, could sense an opportunity. He exhibited classic takeover behavior and grew aggressive toward the females of the group. In a skirmish with Titus’s mother, “Flossie,” Beetsme struck her infant, killing it. Flossie and Cleo, Titus’s sister, subsequently deserted the group, leaving young Titus orphaned and abandoned. For a time, Titus, Beetsme, and the other remaining young males formed a group of their own. But when another group disbanded, females from that group joined them, and Beetsme became the leader of the new family group. He drove away every other male, except for Titus, who he allowed to stay, possibly to help keep the group safe from outsiders. He had succeeded in eliminating competitors for what were now his females — or so he thought. 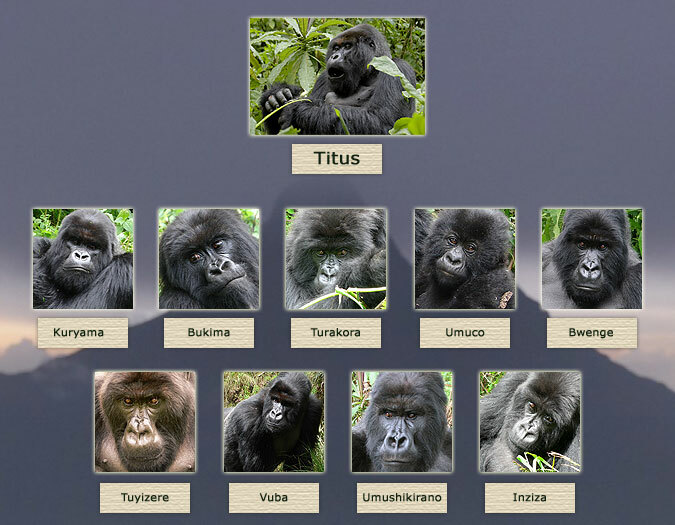 This image shows some of the offspring Titus is known to have sired. Images are not available of all of them, as some may have died or left the area. Click to enlarge. Beetsme was unaware that Papoose, the dominant female, was growing rather fond of his young companion, Titus. Even researcher Martha Robbins agreed with Papoose’s judgment, joking in The Gorilla King that in her own opinion Titus was the more handsome of the two. Behind Beetsme’s back, Papoose was mating with Titus. It was the beginning of an impressive dynasty. In the course of her research, Robbins began a series of paternity tests to see who was having the most reproductive success. The tests proved that Titus had fathered several babies with Papoose, among them, Pasika, Bukima, Turakora, and Kuryama (the male whose challenges to Titus’s reign are documented in The Gorilla King). All told, researchers at Karisoke believe that Titus has sired over 20 babies, though they are still completing DNA tests to make sure. 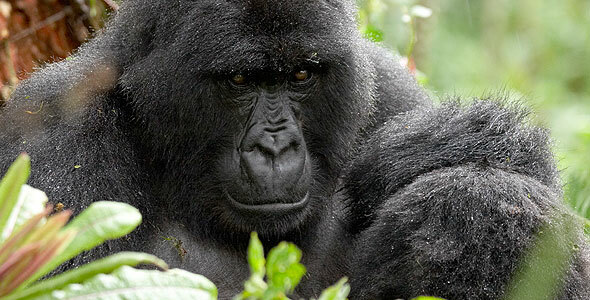 They do know beyond a doubt, however, that he has fathered at least 13 — still more than any other known mountain gorilla. Not too bad for a gorilla who had such enormous odds to overcome.